BMG LABTECH’s innovative absorbance microplate reader has the flexibility to perform assays quickly and easily in both microplates or via the built-in cuvette port. 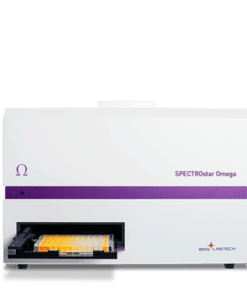 This spectrometer-based absorbance microplate reader captures a full UV/visible spectrum in less than 1 sec/well. Its speed, simple push button operation, and capacity to store individual assay protocols make the SPECTROstar®Nanothe leading microplate reader for absorbance measurements. The upper heating plate of the incubation chamber operates at 0.5 °C more than the lower plate. This prevents condensation build-up on the lid or sealer.